MainAll NewsInside IsraelBennett: You're sitting in Tel Aviv and condemning our soldiers? 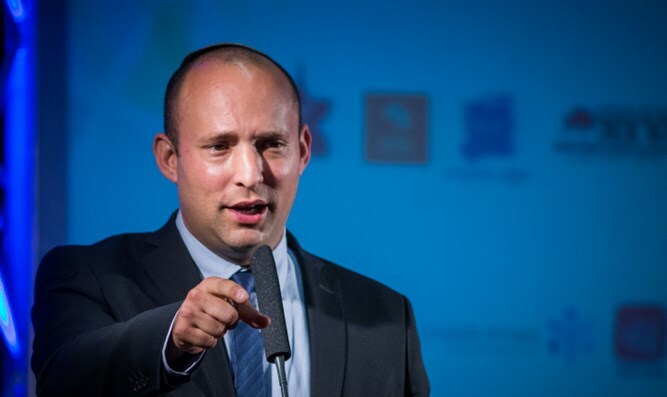 Bennett: You're sitting in Tel Aviv and condemning our soldiers? Chairman of the Jewish Home, Minister of Education Naftali Bennett, refuses to condemn the conduct of soldiers as seen in the clip of the sniper currently being examined by the IDF. The video in question involves an Israeli sniper shooting at a demonstrator during clashes between IDF forces and Arab rioters on the Gaza border. In the video, the rioters are seen through the sniper's gun sight, and a conversation with his friends is audible. In an interview with Efi Triger on Army Radio, Bennett said: "I refuse to condemn the IDF soldiers in the video. To sit in Tel Aviv and to condemn the soldiers is not serious. I back all IDF soldiers." Responding to Triger's question whether the enthusiasm of the soldier who filmed the incident after the shooting does not bother him as education minister, Bennett replied that he "refuses to get excited. I support all the soldiers of the IDF." It should be noted that an initial examination revealed that the force that filmed and documented the incident did not carry out the shooting. It was also found that the incident took place some four months ago, last December, and not during the riots along the Gaza border of recent days. Further, it was also clarified that the Gazan who was shot was not killed.